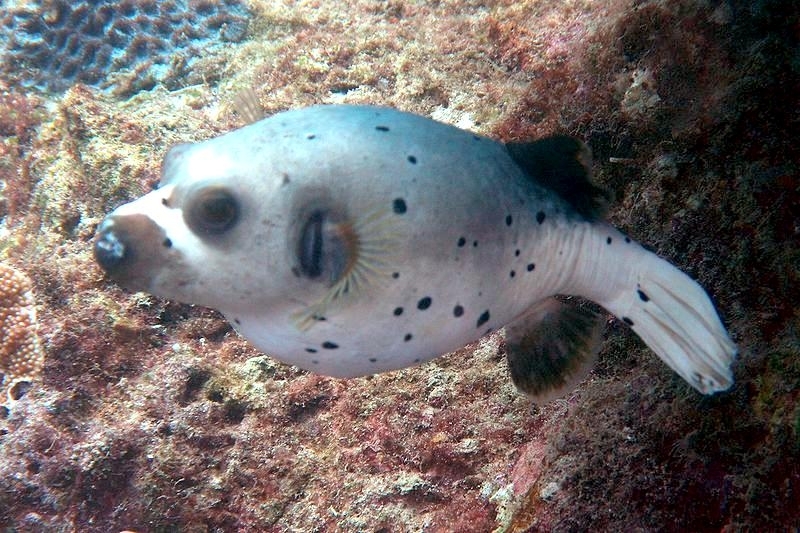 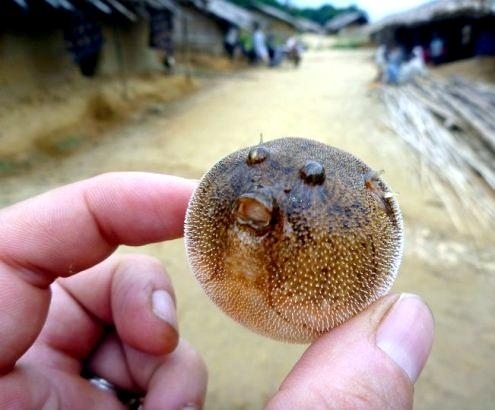 The Pufferfish is also known as the Blowfish, is an easily recognized type of fish due to ability to transform & enlarge its body in a split of a second. 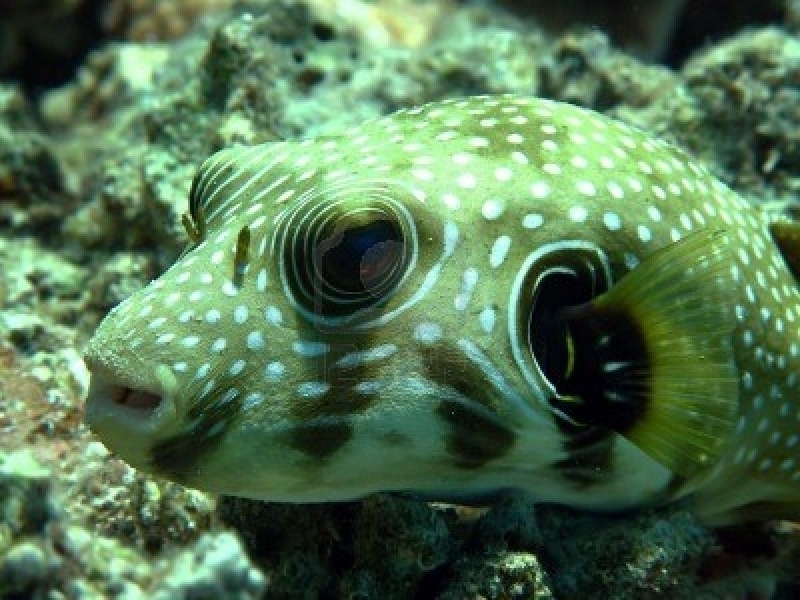 There are more than 120 species of Pufferfish which live mostly in the warm waters of the Indian Ocean, Pacific Ocean and possibly the Atlantic Ocean with another 30 species that live in the freshwater. 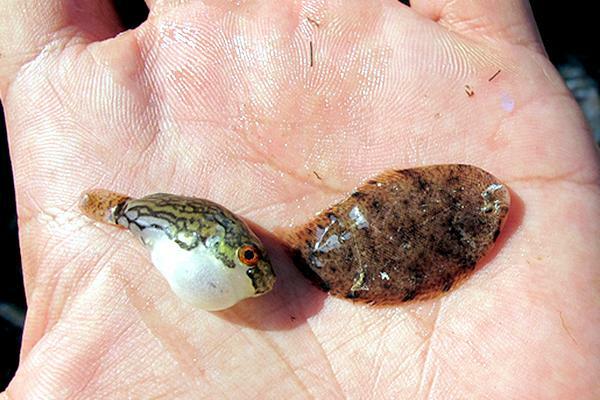 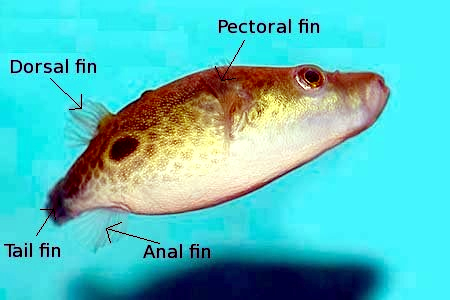 Some species move from marine to brackish or freshwater during the breeding season. 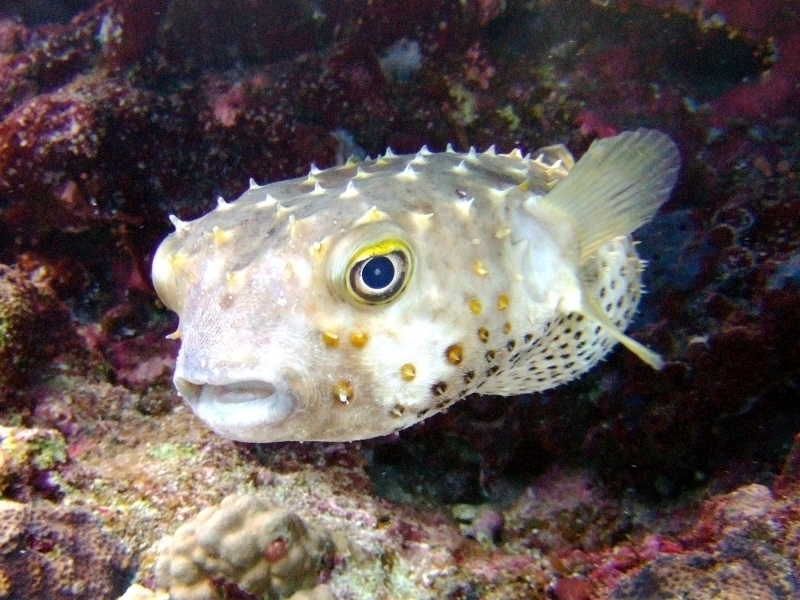 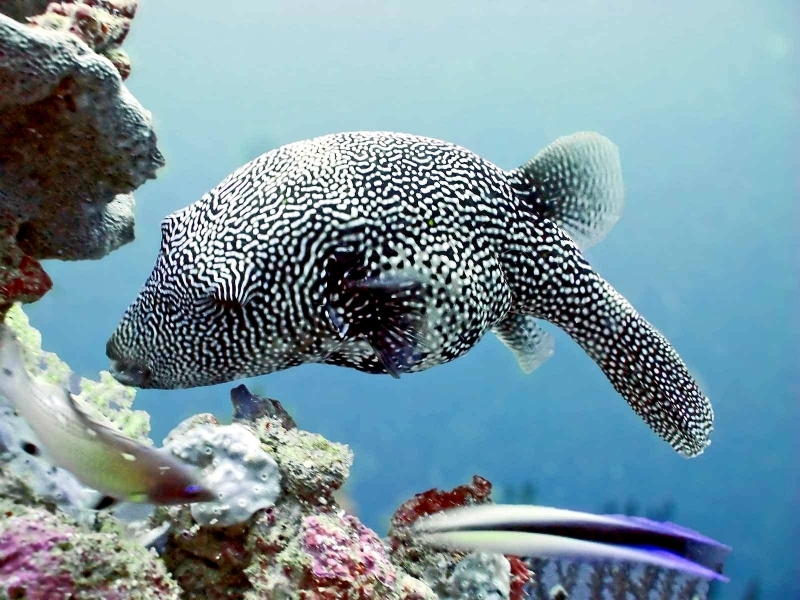 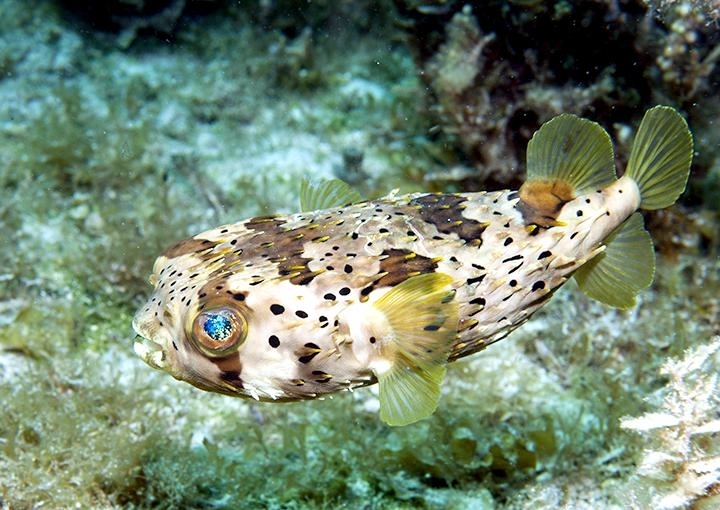 Although the number of Pufferfish is stable in the wild, they are vulnerable due to over-fishing, pollution of the ocean and loss of natural habitats. 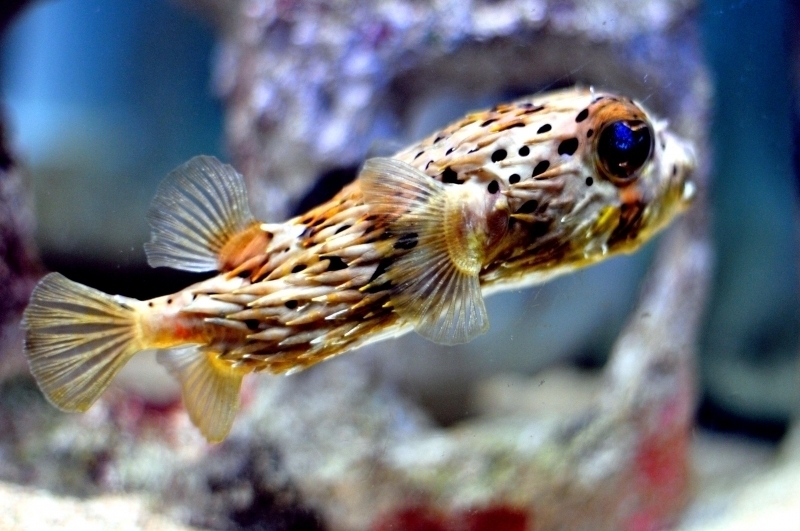 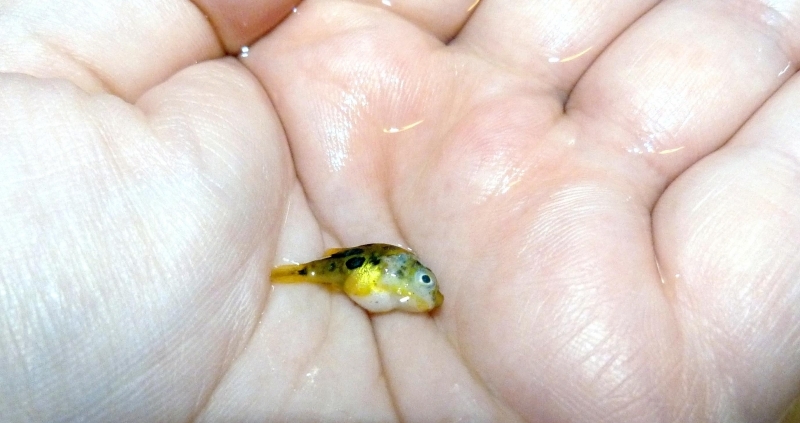 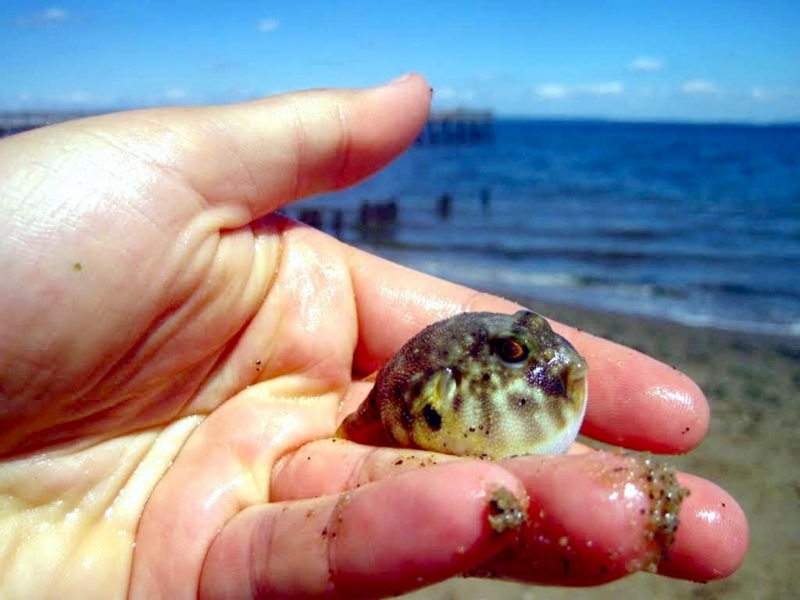 * Pufferfish vary in size from 1 inch long Pygmy Pufferfish to a 2 foot long freshwater Giant Pufferfish. 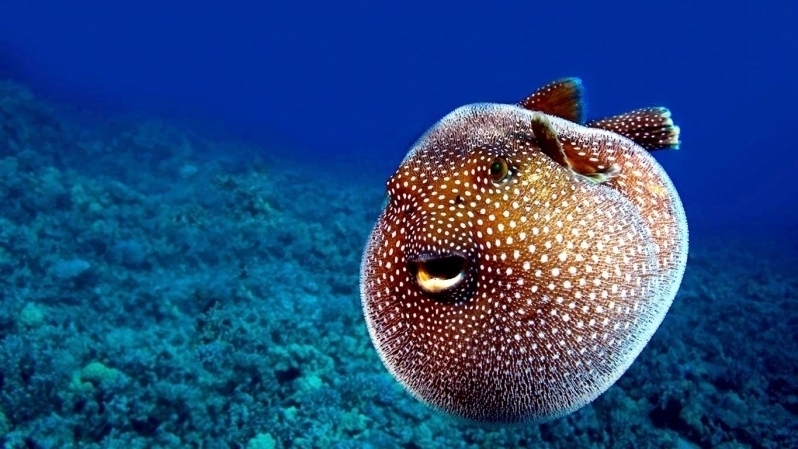 * Common to all Pufferfish is ability to ingest a huge amount of water and air sometimes, which increases their body size and turn them into odd-looking ball-like creatures. 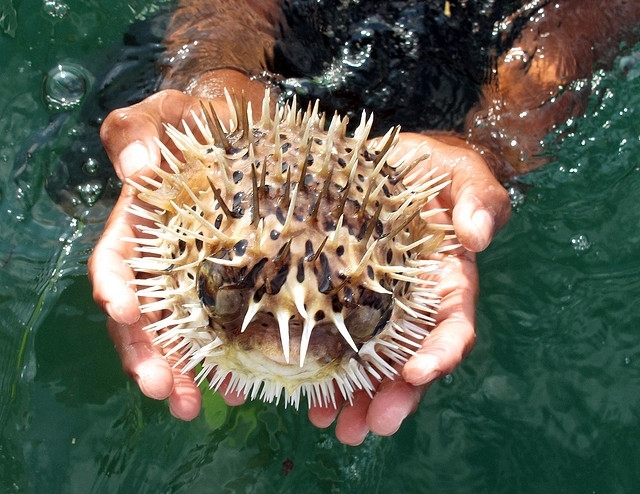 Quick transformation scares predators. 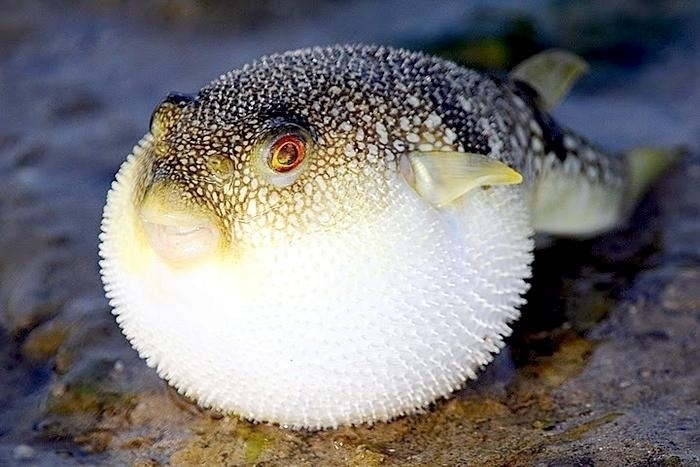 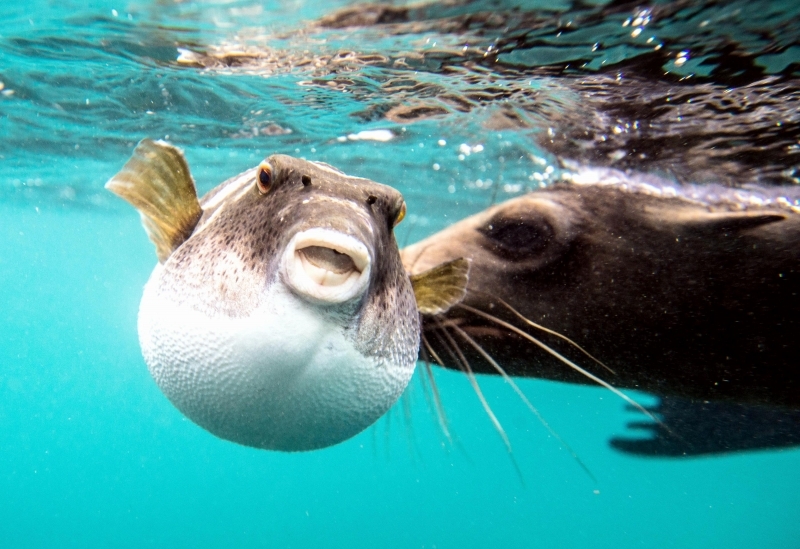 * Scientists believe that Pufferfish developed this tactic as a method of the self-defense because they are poor swimmers that cannot escape from the danger quickly. 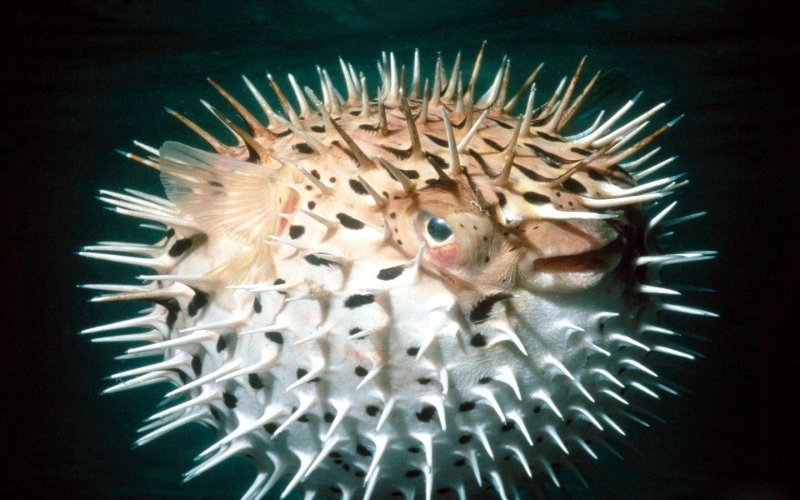 * Increase of the body size is not the only tactic used against the predators. 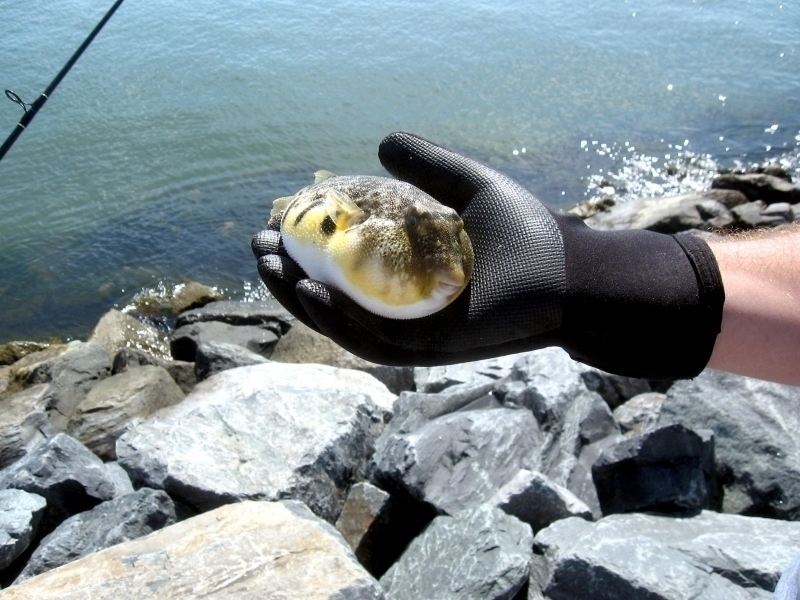 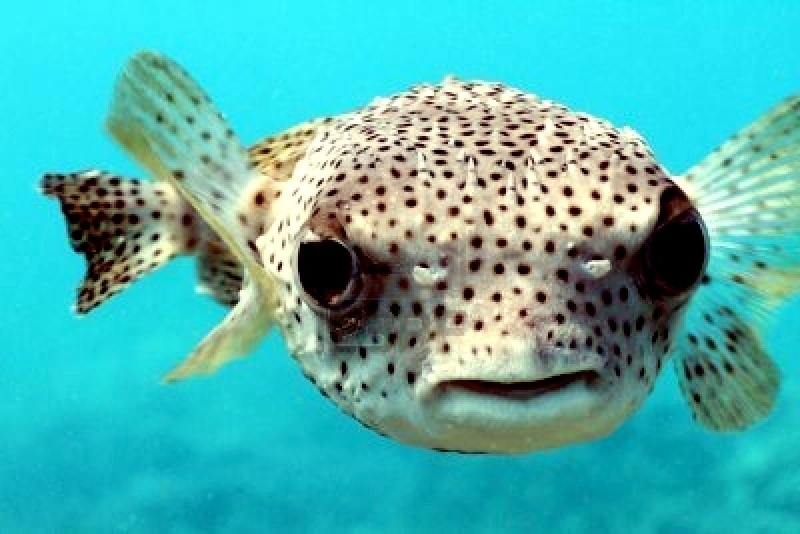 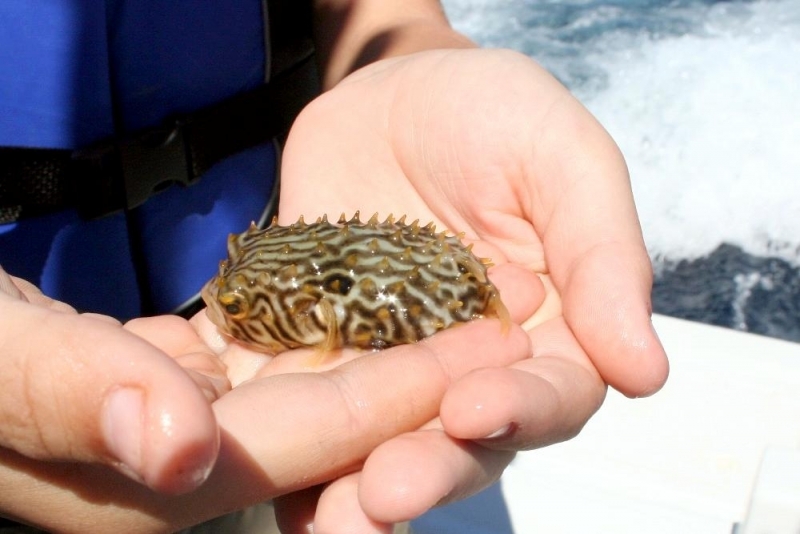 Almost all species of Pufferfish contain toxin (called tetrodotoxin) that can be 1,200 times stronger than cyanide. 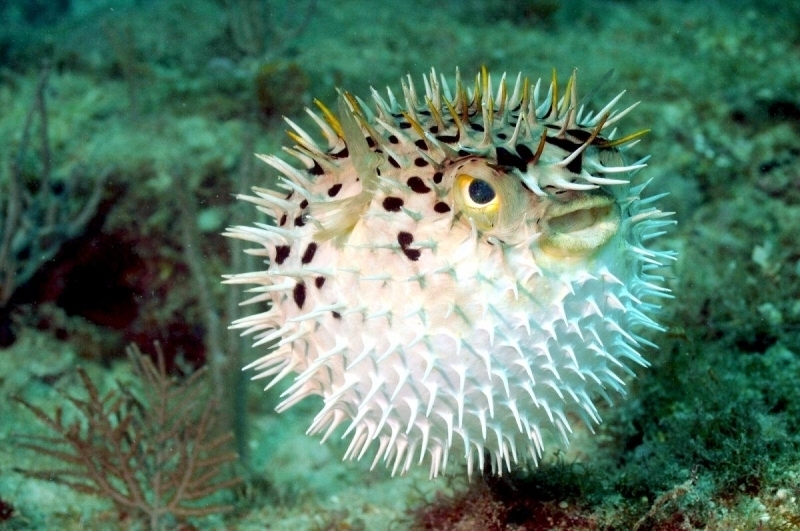 * A Pufferfish contains enough toxin to kill 30 adult men. 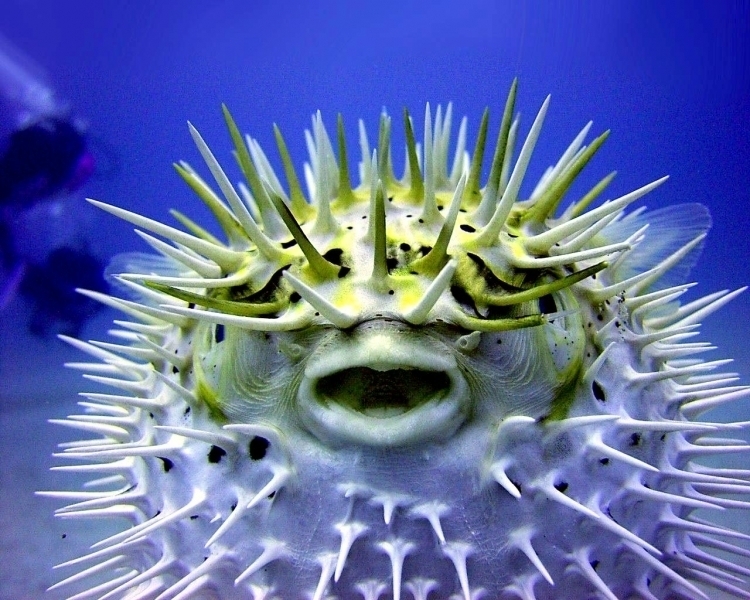 * Toxin is not located in all parts of the Pufferfish and certain cultures prepare Pufferfish (called Fugu in Japan) as a delicacy. 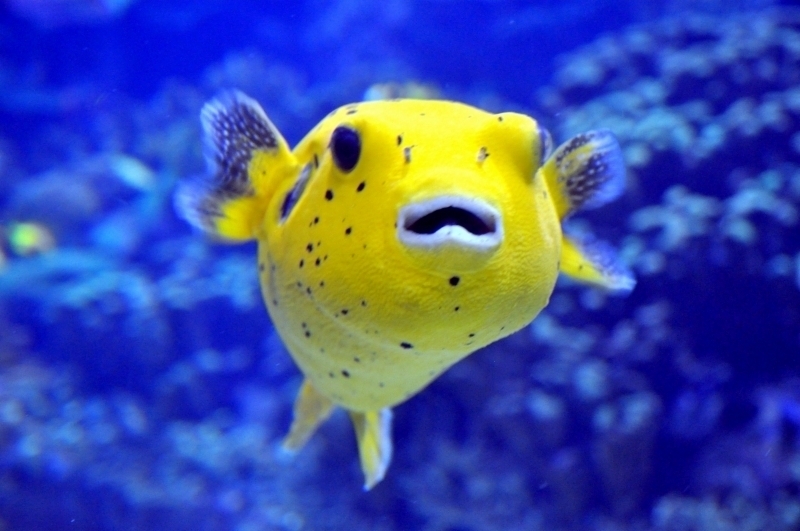 Only specially-trained chiefs can clean the fish properly and prepare a delicious & toxin-free meal. 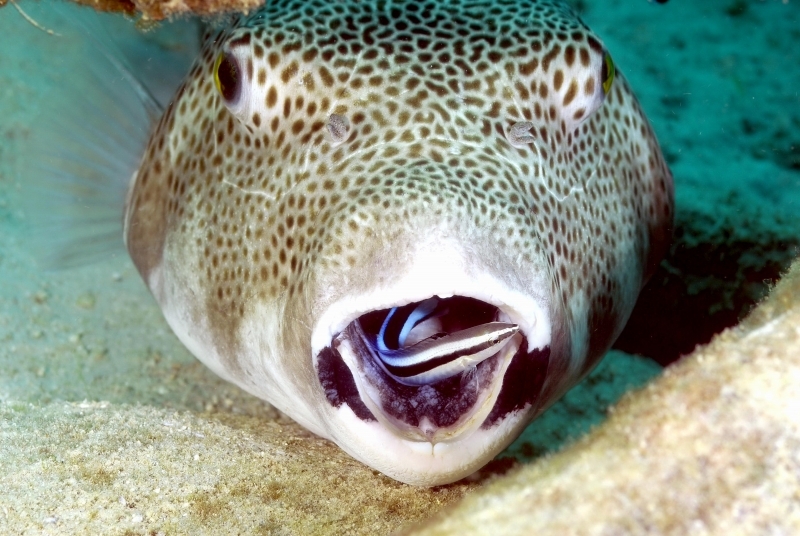 Just one wrong cut of the fish meat can result in the death of the customer. 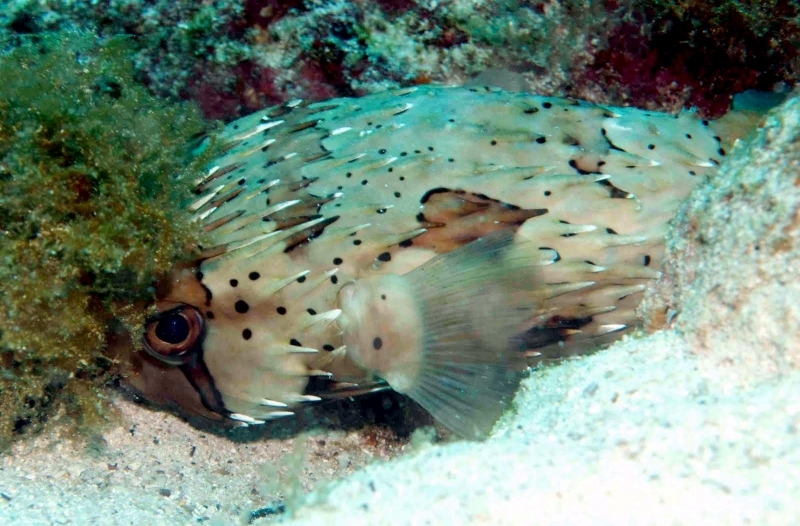 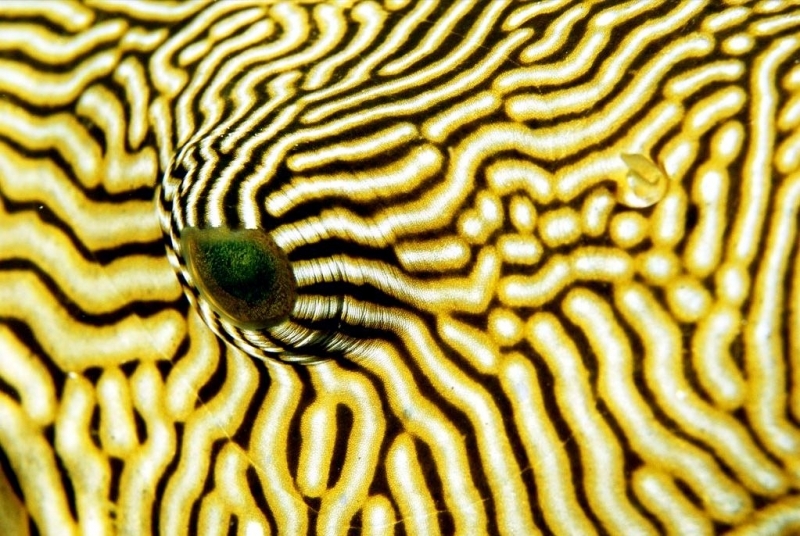 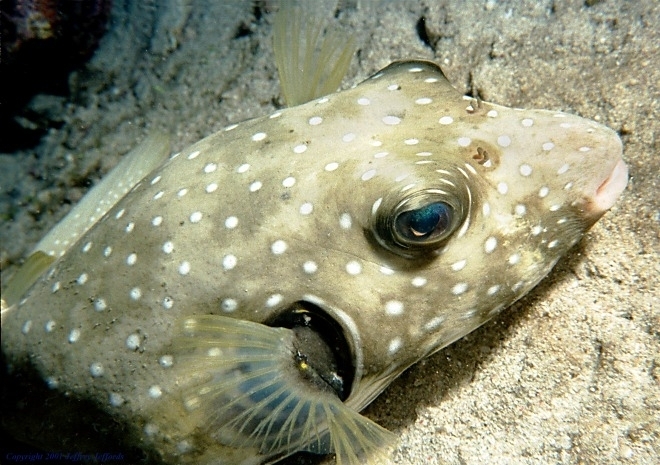 * Tiger Sharks are the only species immune to the Pufferfish‘s toxin. 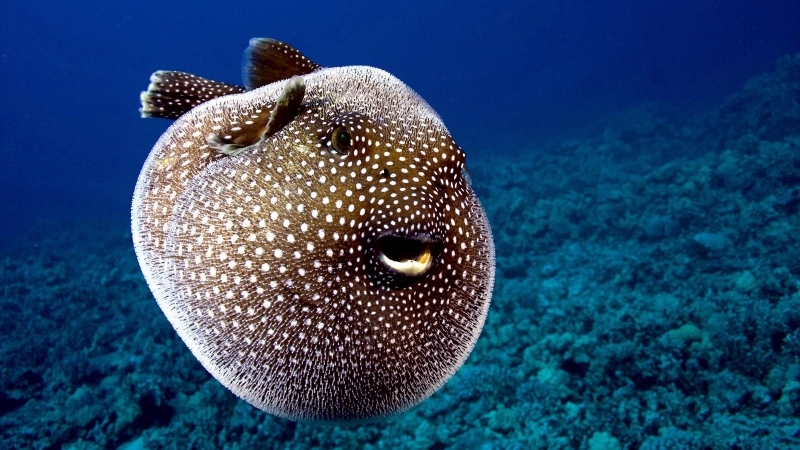 They can eat Pufferfish without any negative consequences. 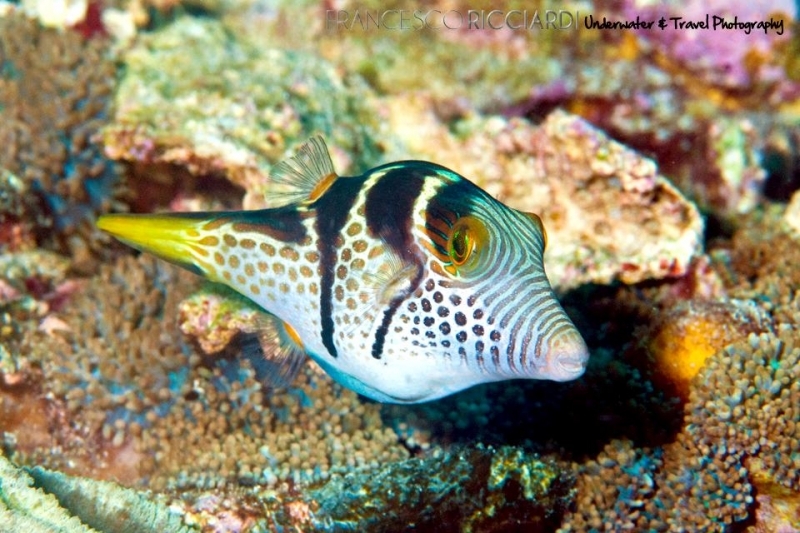 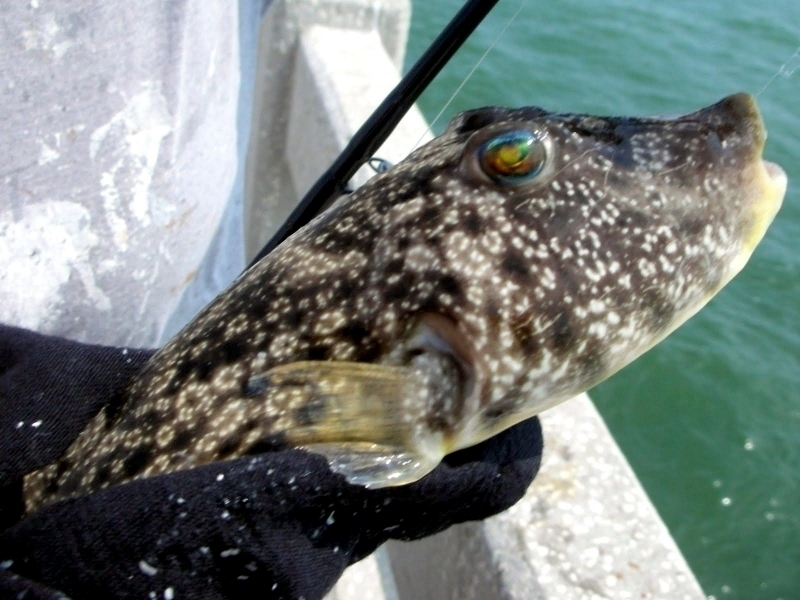 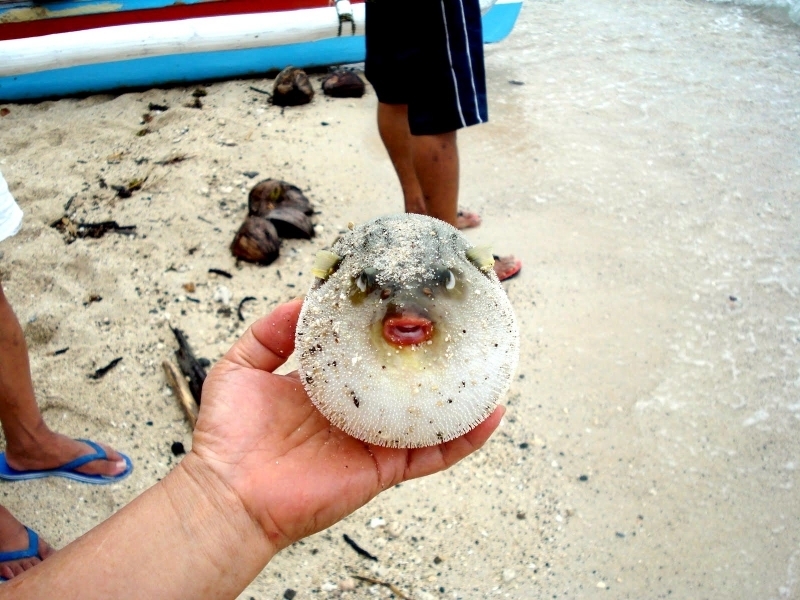 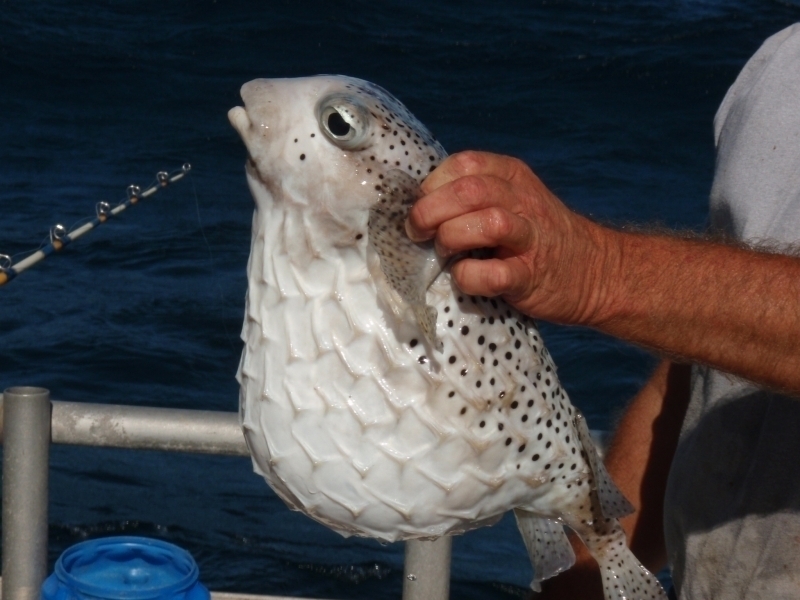 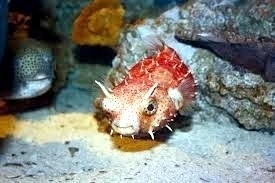 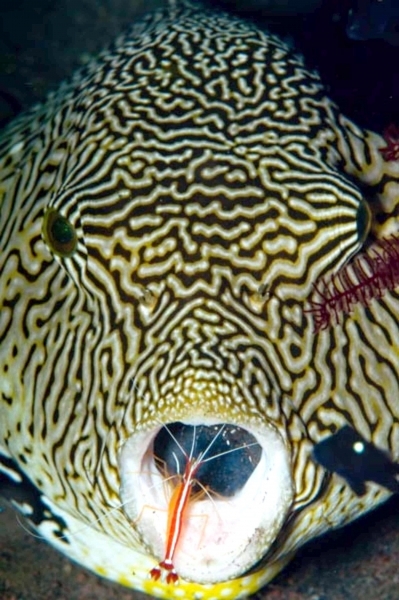 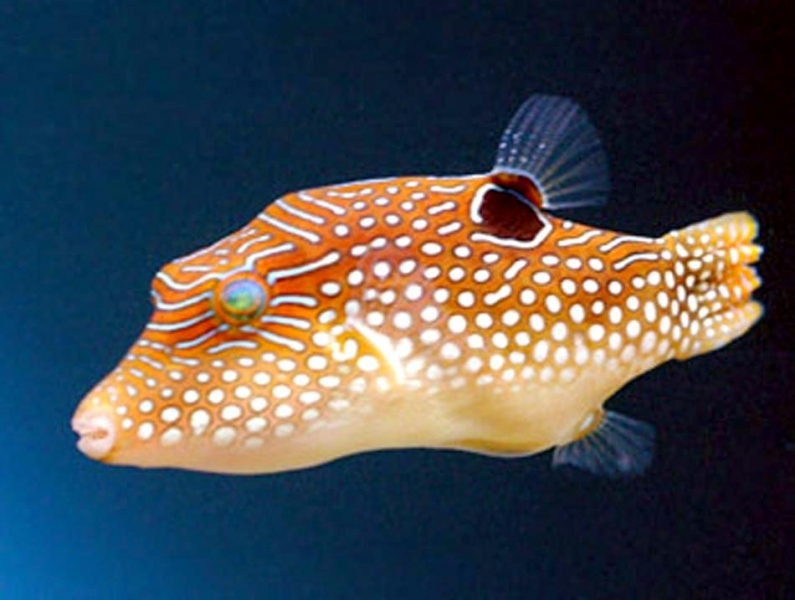 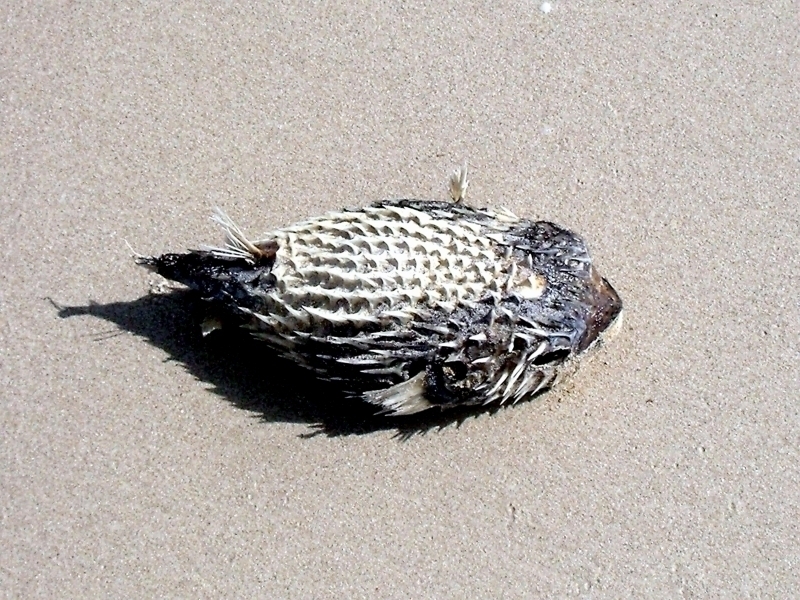 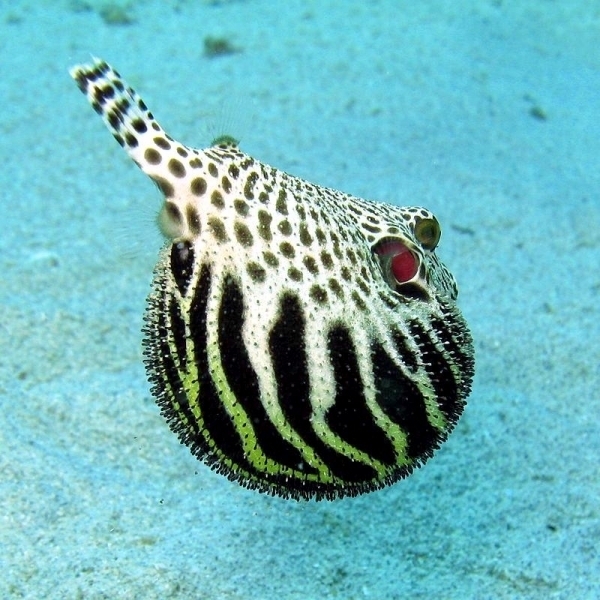 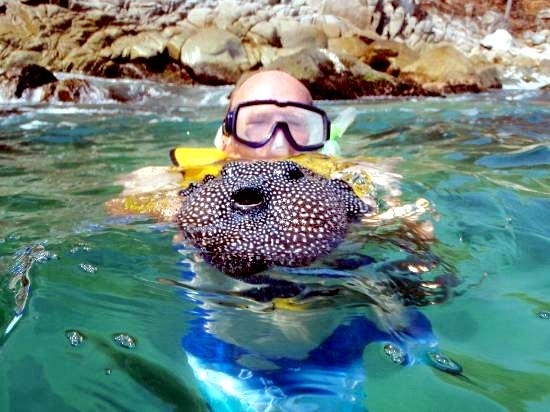 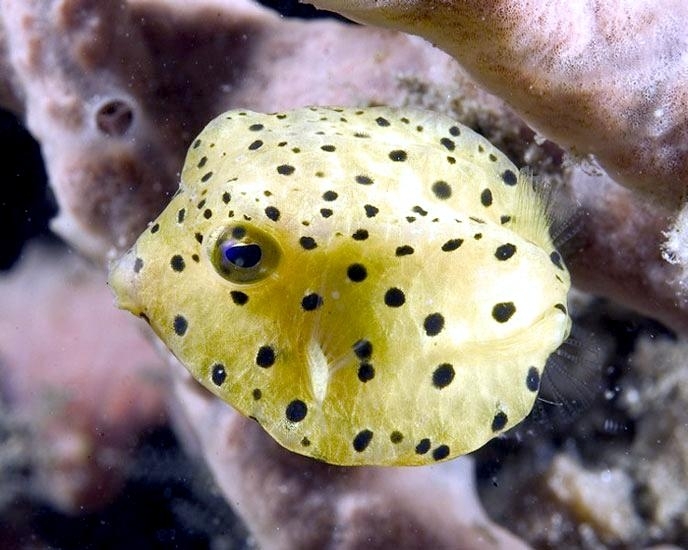 * Pufferfish can be discretely or brightly colored. 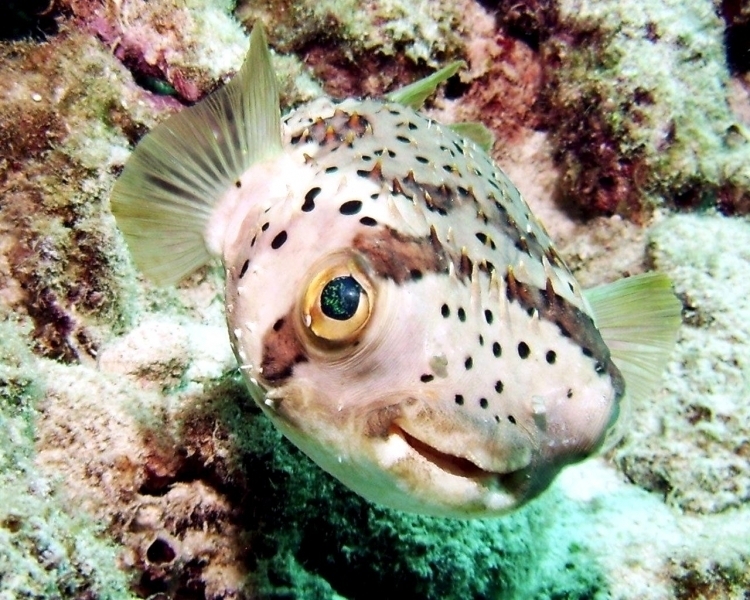 There is often relationship between the body coloration and the amount of toxin produced by the fish (brighter colors are often associated with large quantity of toxin in the fish). 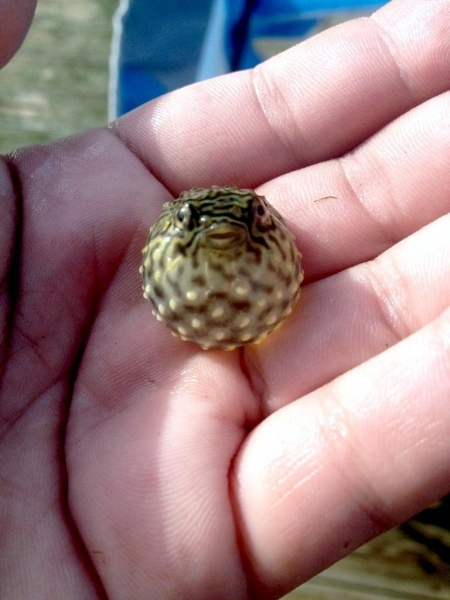 * Pufferfish do not have scales. 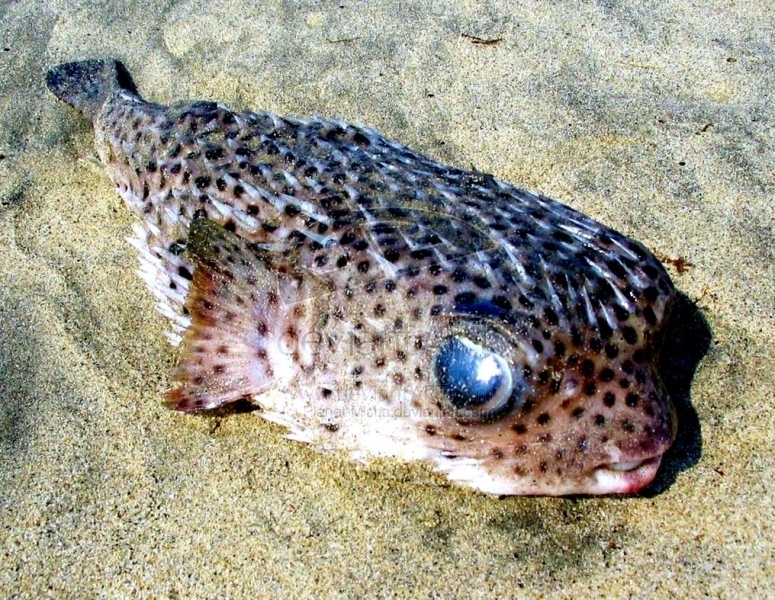 Their skin is thick & rough. 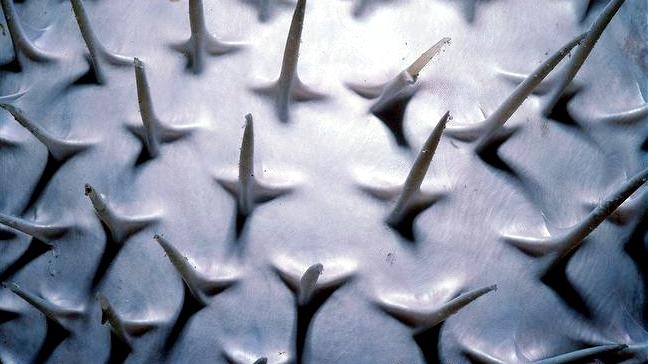 Some species have spines on the skin, which offer additional protection against the predators. 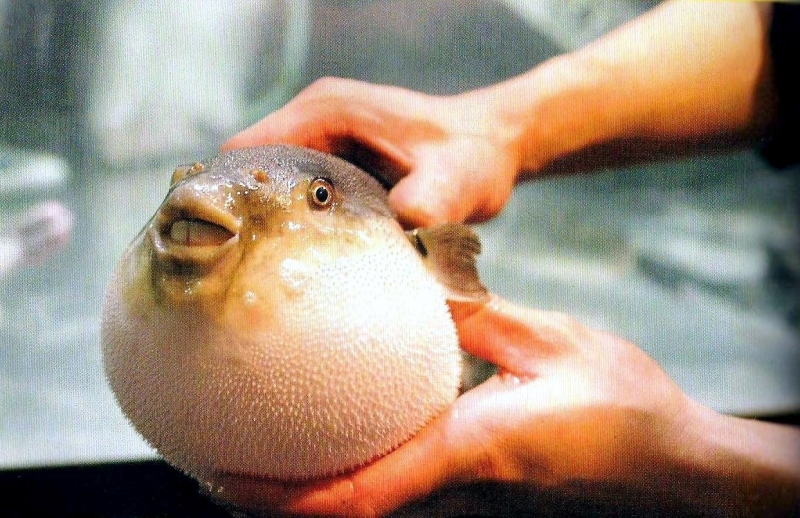 * The most elastic part of their body is skin on the stomach area. 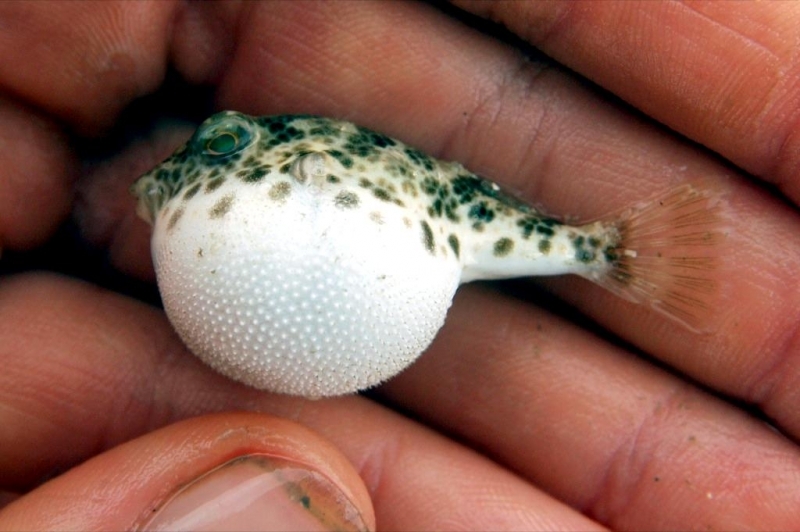 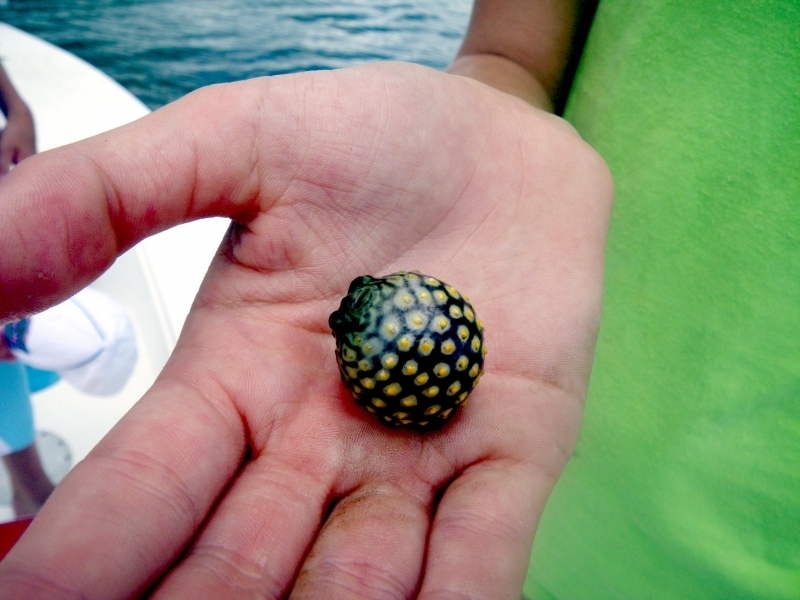 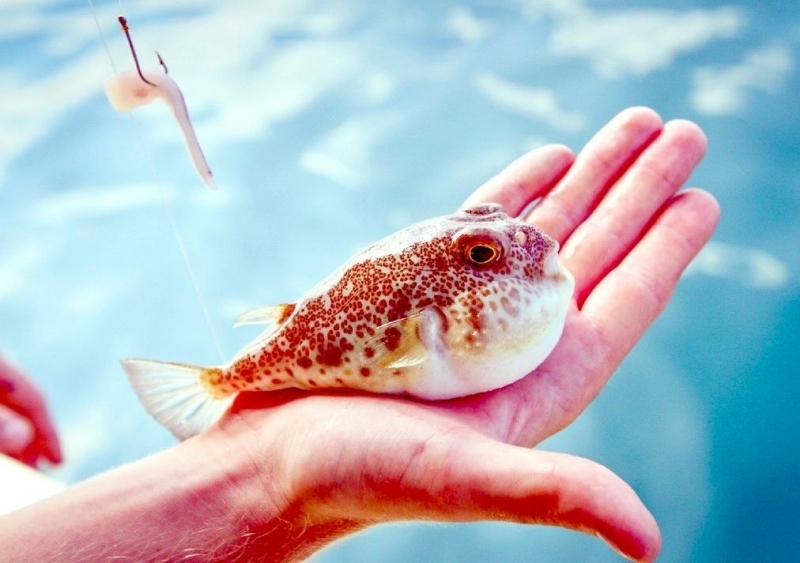 When Pufferfish ingests water, skin on the stomach expands several times of the normal size of the fish. 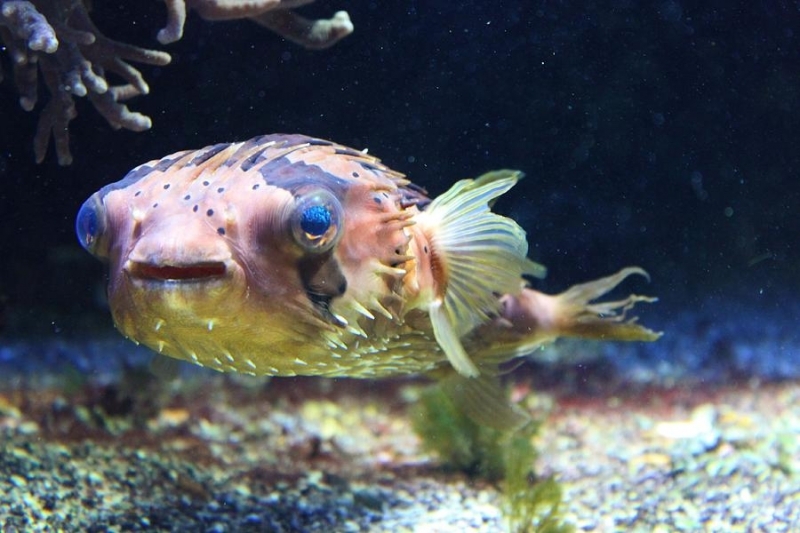 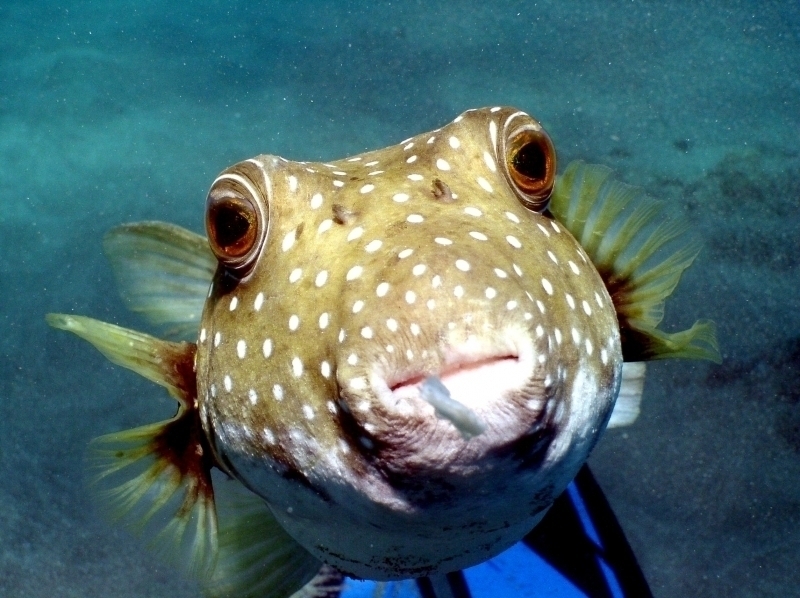 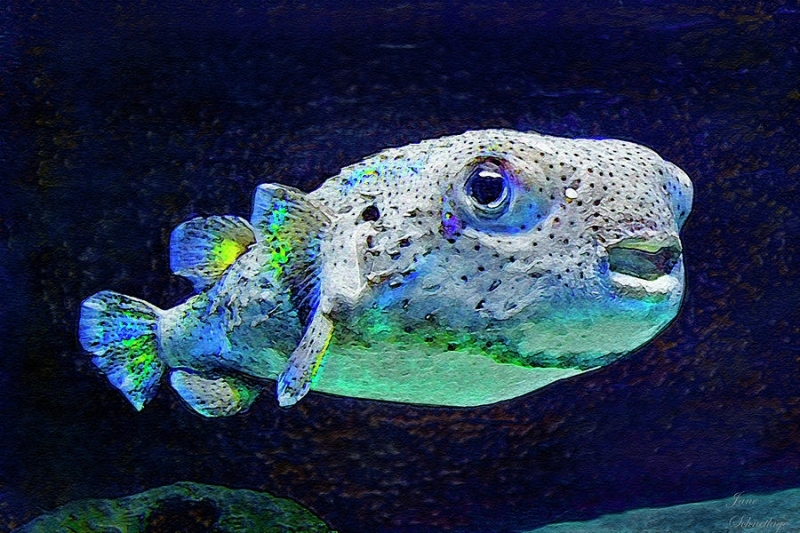 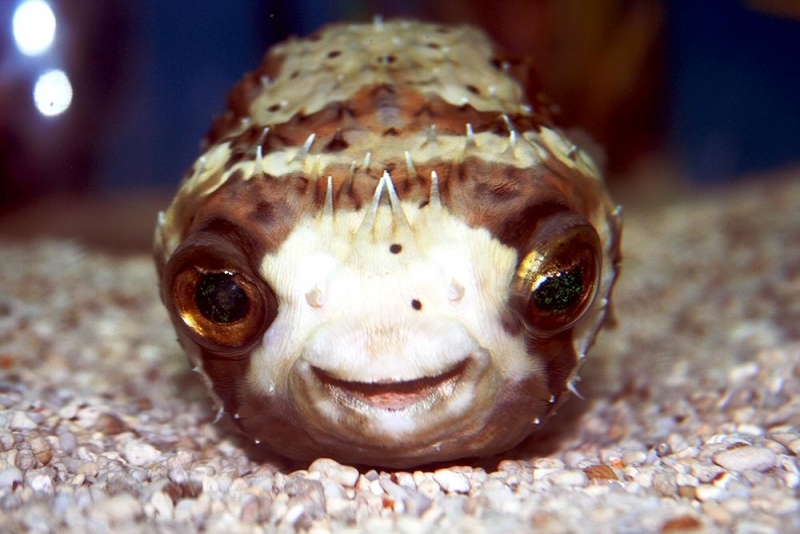 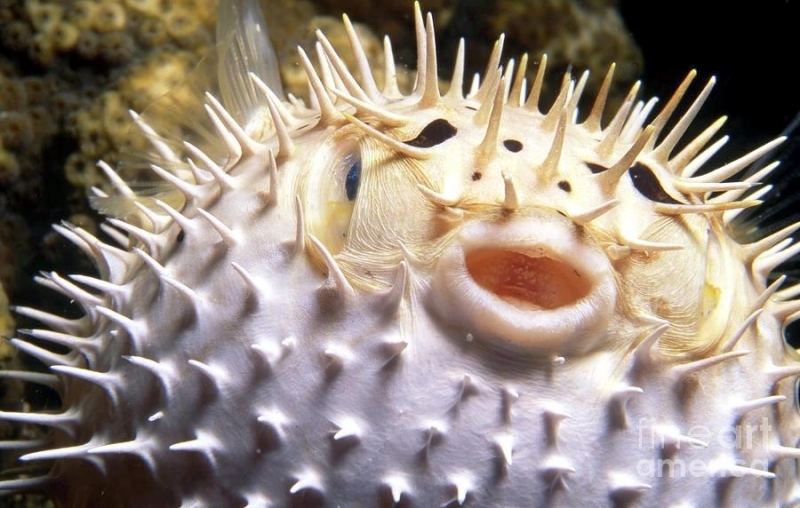 * Pufferfish have 4 teeth that are fused in the beak-like structure. 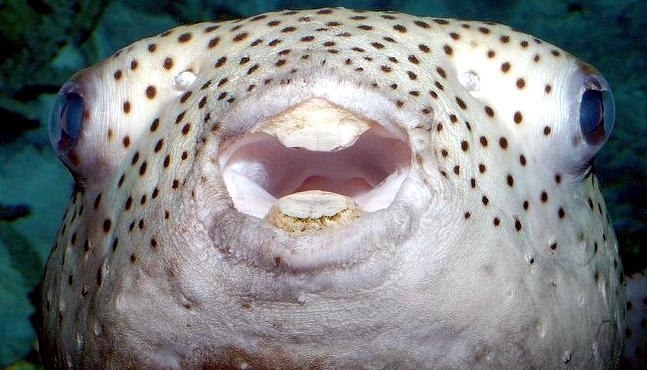 They use their teeth for opening of mussels, clams and shellfish. 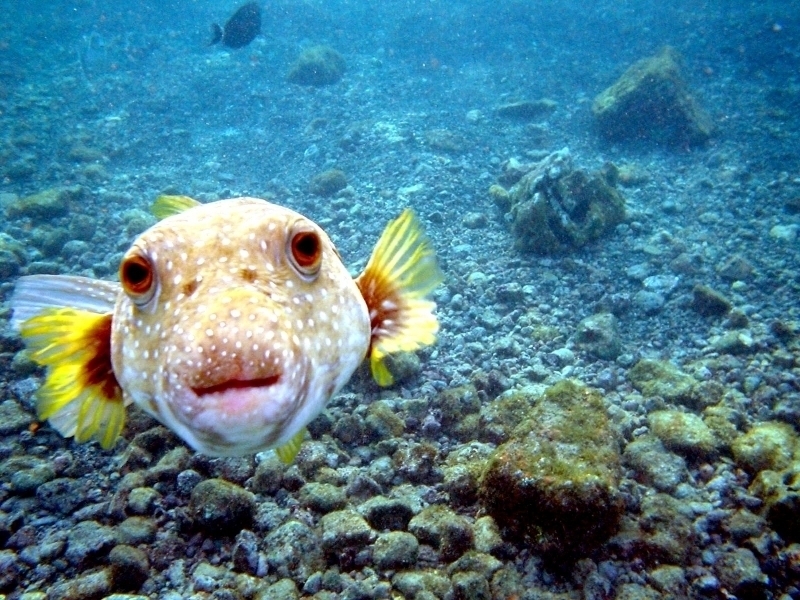 Pufferfish also eat algae and different types of worms & crustaceans. 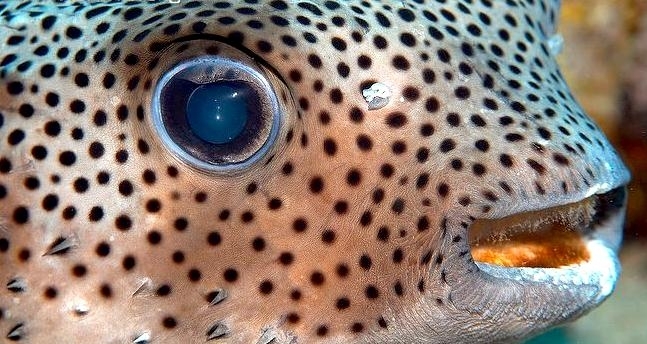 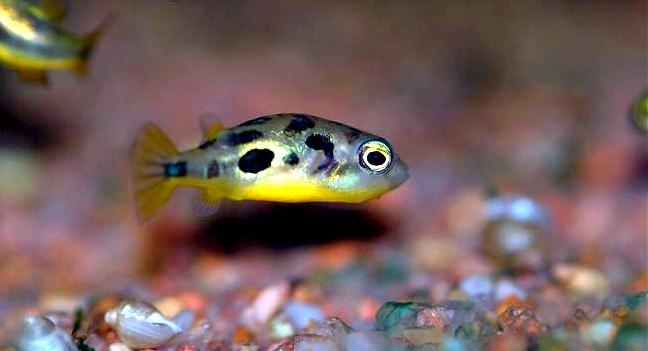 * Pufferfish have excellent eyesight. 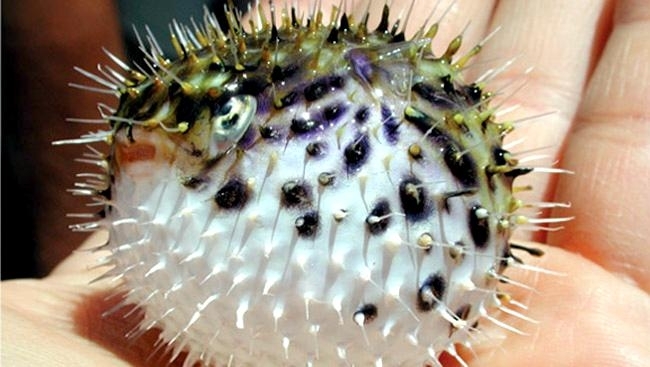 * Pufferfish reach sexual maturity at the age of 5. 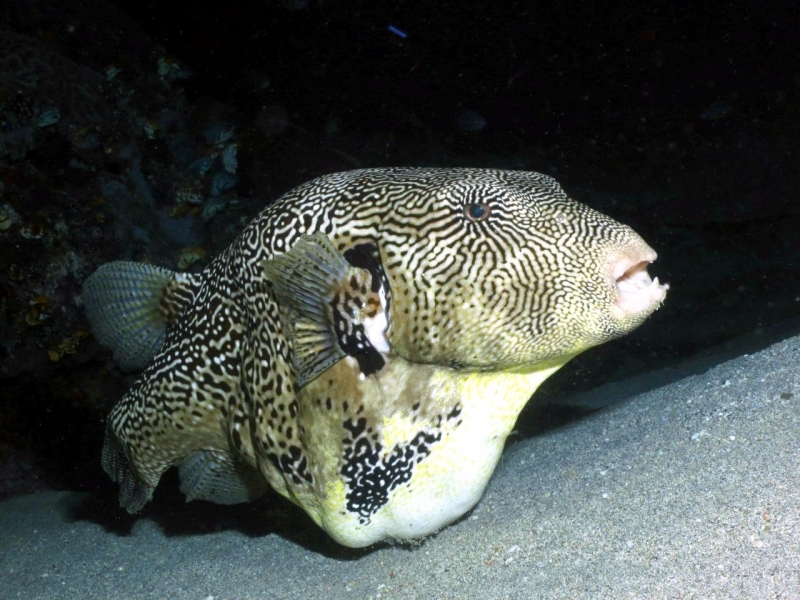 The male guides the female to the shallow water close to the shore, where she will release between 3-7 eggs. 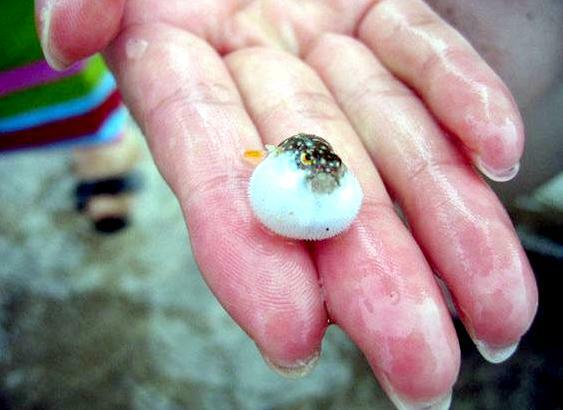 The young are protected by the hard egg-shell that will crack as soon as they are ready to hatch. 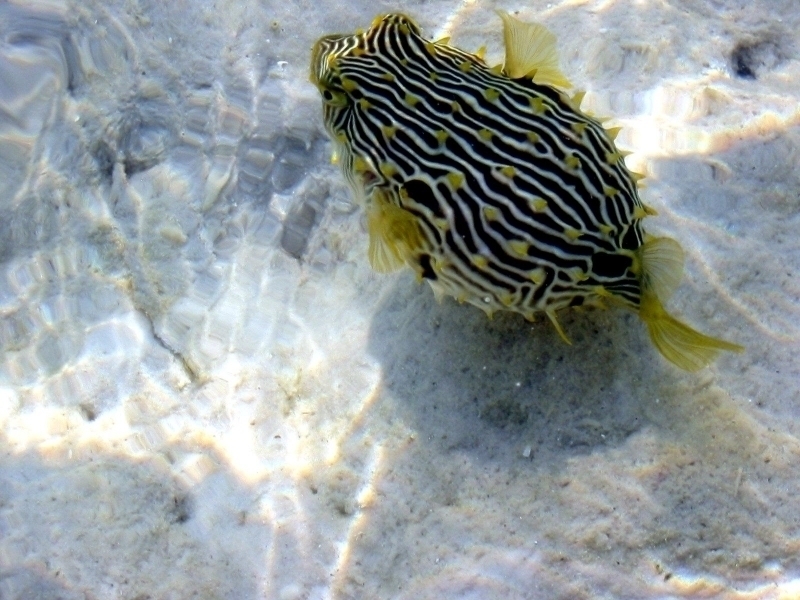 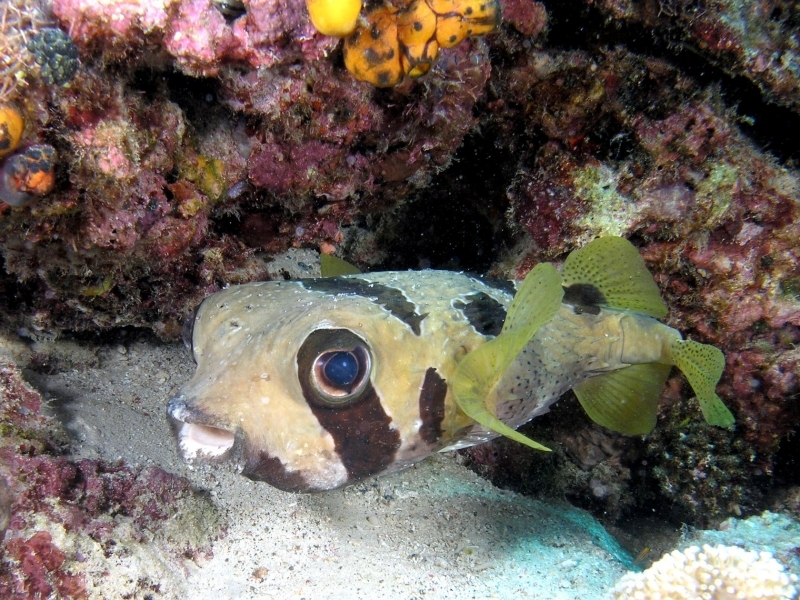 After leaving the egg, young Pufferfish swim toward the reef’s community. 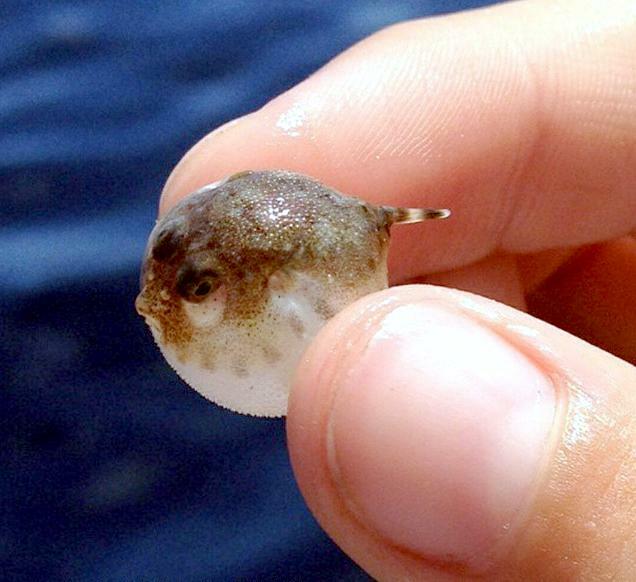 * Although some baby Pufferfish cannot be seen without magnifying glass, their body shape resembles those of the adult animals. 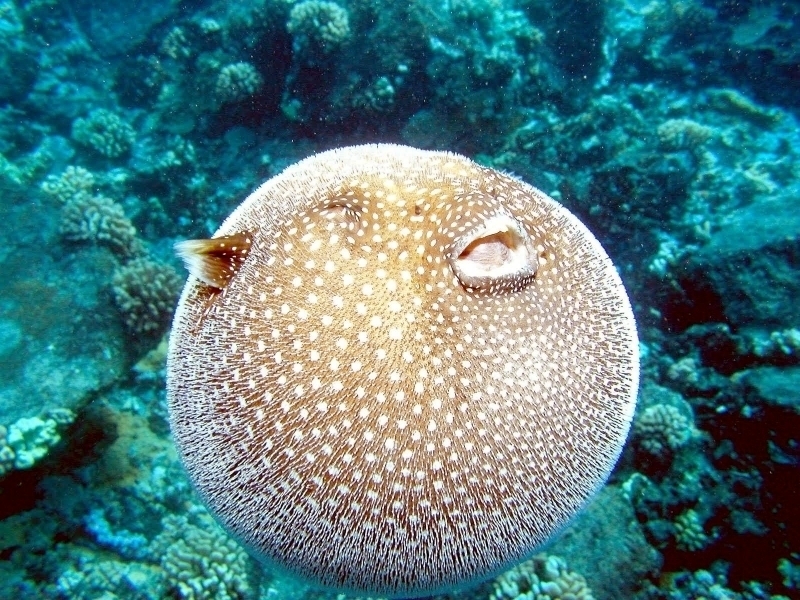 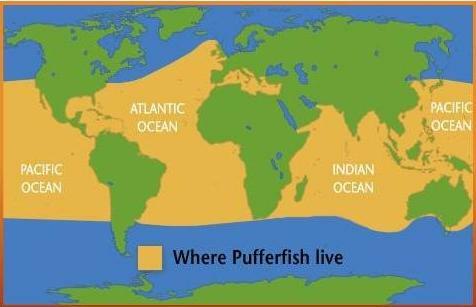 * Average lifespan of the Pufferfish is around 10 years.